If the group cancel within 24 hours of arrival, 100% of 1 nights accommodation is charged. If they cancel their booking within 2 weeks of arrival, 10 % of 1 nights accommodation is kept. Cancellation before 2 weeks prior to arrival warrants no penalty and if the amount has already been paid, it will be refunded in full. If part of the money needs to be paid in cancellation costs, the remaining money the group have paid to us will be refunded. In all cases of us refunding money, any bank fees incurred will not be paid back to the group. Groups MUST contact us directly to confirm an arrival time. Welcome to Bergen Ymca Hostel! 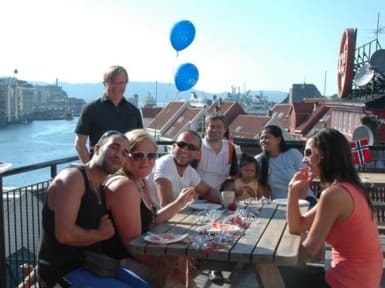 The hostel has a superb location in the city center, only one minute from the famous Fish Market, the old town of Bryggen and the funicular up Mount Fløyen. 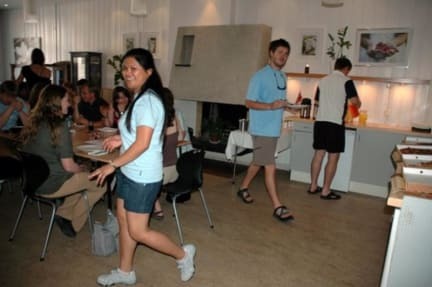 The hostel is a great starting point, whether you want to explore the city itself, or head on to see the some of the well-known fjords and glaciers in Western Norway. The hostel is within easy reach of shops, restaurants, attractions and public transportation (buses, ferries and trains). The rooms are bright and spacious, with en-suite facilities. We offer single, double, 4 and 6 bedded rooms. Budget dorms are available the whole year. Other facilities: WiFi, lounge and common rooms, fully equipped guest kitchen and a big roof terrace with an amazing view over the harbour! The hostel is open all year. Linen is included in the price for your convenience. I was thrilled with this hostel. The location is phenomenal. Bergen is a fantastic city with everything very close to the hostel. The price is very affordable. I found the hostel to be safe and secure and clean. The staff I interacted with were wonderful and able to answer any question you might have. I also was traveling with my senior citizen mother and she found it to be excellent as well. Thank you. Really nice place with relaxed atmosphere. Clientele is almost exclusively other travellers, did not see any of the (oftentimes weird) long-term residents some other hostels have. Facilities were great and very clean, as were the rooms. The location is perfect, you get literally everywhere in 5 mins. Only reason for complaint may be the minimalistic reception hours, as late arrivals must have reliable internet connection and their credit card available to access the self check-in procedure. A fantastic location and comfortable facilities. Would definitely stay again. A great hostel in the heart of Bergen. The staff was really friendly even though I checked in in the last minutes of opening time. My room had a big window and was really clean. Only downsides are missing lockers and there could be more electrical sockets. Opening time of the reception is short but there is a security guard patrolling also inside the building at night times. Location was super and it was easy to check in after reception was closed. There was only one place to charge phones in rhe room. The location and the cost are the best things about this hostel. The rooms weren't comfortable, despite there being ensuite bathroom. They didn't provide towels and the reception is closed on weekends. There are no lockers and they advertised a guest kitchen but it didn't seem to exist (or was locked up). The vibe was just kinda depressing, which was important to me as a solo traveller but this place is fine for groups looking for a cheap place to crash in a good location. There was no breakfast in the morning like there was supposed to be and the reception is not open 24/7. The roof top is only open 5 hours a day. The only thing that I enjoyed about this hostel is the location and the kitchen which is well equipped.